Day 26 – My Journey to being healthy, pregnant and toxin free. If you are trying to get pregnant then you should start taking prenatal vitamins and establish a well-balanced diet. I am neither a doctor nor an expert on prenatal vitamins, but I have done my own research and am providing basic information that can help shed some light on taking them as well as natural alternatives derived from organic whole foods. This entry is to help spark awareness that, as a woman, you have a choice as to what you will take when it comes to prenatal vitamins. You don’t have to follow the synthetic, doctor prescribed vitamins. You have a choice and I hope that you dig a little deeper into what I’m going to be covering. This is the health of your unborn child, so make the best decision for you and for him or her. Our generation is plagued with drug company commercials that state the side effects as well as what problems the drugs will mask. No matter how many times I see these commercials I am still shocked that a certain generation will come to think that this is normal and a healthy choice. It is our job, as people who value our health and what we put into our bodies, to educate our children with regards to medications, when to see a doctor, when to see a chiropractor or an acupuncturist, what natural remedies can be used, and how to eat healthy and take care of our bodies naturally. I believe there is a time for every kind of medicine. All medical fields need to work together as one. I chose my doctors carefully to make sure they would all work together. I will always be on the preventative side of health. I maintain my regular visits to my chiropractor and acupuncturist. Should I get sick and cannot cure myself naturally seeing the two latter doctors, I will go to my family doctor. While medical doctors have a very important role in our society, I still value alternative means and natural herbs to cure common ailments. Don’t take what you put into your body lightly. The following information is to help you know what other options are available that are approved by most doctors. As we don’t know to ask, we tend to not know we have an option. Prenatal vitamins are designed to provide you and the baby with vitamins that you normally might be deficient in that the baby will need to grow. This is especially important in the first 28 days after conception as the neural tube develops, as well as in addition to the next 9 months as the baby develops. One specific supplement that is very important for fetal growth and development is folate or folic acid. This can be a whole subject matter in itself. Please use the link below for additional information. Folate is the naturally occurring vitamin while folic acid is the synthetic version. They both work the same way but folic acid is better absorbed by the body. You can get folate through foods such as leafy green vegetables and fruits. Folate or folic acid is essential to a baby’s development, as are calcium and iron. Most of us do not get enough of these in our daily meals and thus need to take a supplement. 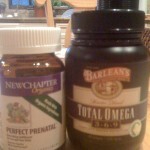 Prenatal vitamins provide us with the right balance for our babies and ourselves. Take what is recommended, as too much of any item can be harmful. If you plan on becoming pregnant you should start taking these before you begin trying. You can pick up prenatal vitamins at your local health store, grocery store, or from your doctor. I prefer to get mine at Whole Foods. I take New Chapter Organics for my prenatal vitamins; I really like these as the vitamins come from organic food and are not synthetically derived. Should you purchase prenatal vitamins from your doctor, the majority of the time they will be the synthetic version. I’ve heard many women complain that the prescription vitamins make them nauseous, causing some women to stop taking them altogether. I’ve also heard some women say that they feel the prescription vitamins have led their baby to be colicky (I will discuss an all natural remedy for this later on! ), and thus they don’t take them during their second pregnancy. This decision is entirely up to you. I believe that you should take the vitamins; if any prenatal vitamins make you sick, try another brand. To stop taking them altogether is a dangerous decision for the health of your baby, in my opinion. There are plenty to choose from, and most doctors do not have a problem should you decide to take over-the-counter all-natural prenatals. Don’t be afraid to ask. ). 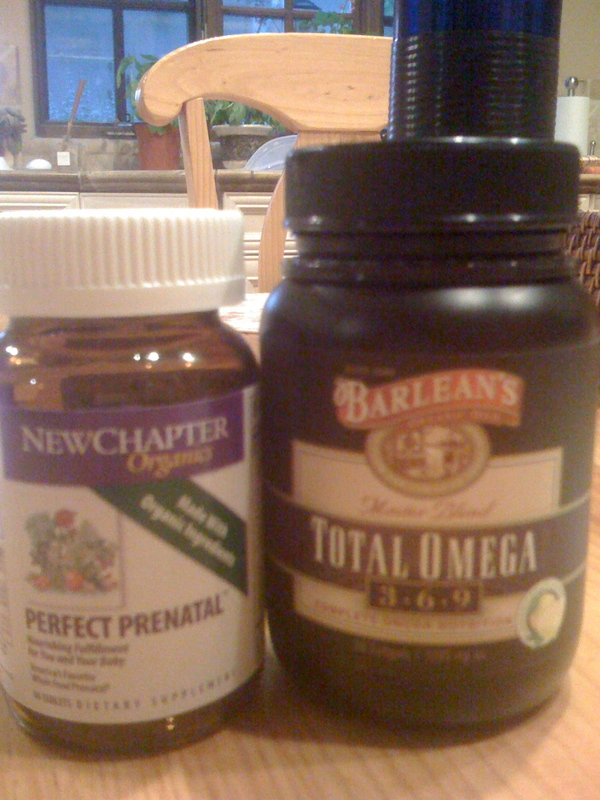 I chose Barlean’s Organic Total Omega 3-6-9. It is flavored naturally with lemon so there isn’t a fishy smell or taste, unlike other omega products. Consult your doctor about what you’d like to do. While the FDA does not regulate what goes into vitamin and mineral supplement (hooray!) here’s a link to what is recommended for prenatal vitamins. Of course, do not take any by-the-mouth cleanses, diet pills, or additional vitamins with your prenatals. Again, you are in control of your body. Research and do what makes you happy.